Aaron and I are just breaking the surface of chapter books: there are so many I want to read to him that I find the task of selecting "the perfect book" to be a little daunting. Up to this point, I've tried to pick ones with plenty of pictures scattered throughout, short enough that it won't take us years to finish, and with a plot-line that will intrigue a four-year-old. Charlotte's Web fit these requirements perfectly. The story begins when Wilbur (a pig) is born the runt of the litter. He is about to be "done away with," but is rescued by the farmer's daughter, Fern. She raises him as a pet, and he is eventually moved to Uncle Homer's farm where he is visited regularly by Fern and enjoys sleeping on his warm manure pile and eating his tasty slops. Wilbur could almost be content except that he yearns for a friend. And that is when he meets Charlotte, a common grey spider, who befriends him and ultimately saves his life. 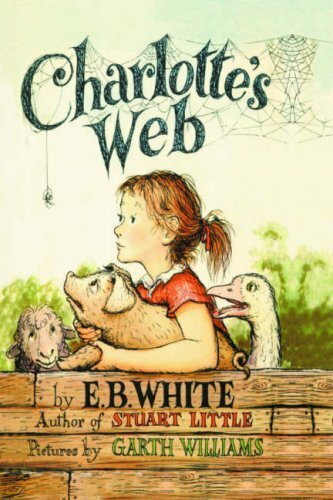 Some think that Charlotte's Web, while much-loved by adults, holds very little appeal for the modern child. And while I maybe read just a smidgen faster through some of the descriptions of lazy summer days and perfect dewy mornings, overall I didn't have to do much to hold Aaron's, and even two-year-old Maxwell's, interest. Even though I am absolutely terrified of spiders in real life, in the safe confines of a book, I loved Charlotte...although I did better when I thought of her more in her mentor-role and less in her spider-role. She was kind and honest, and even though she loved Wilbur, she treated him in a very no-nonsense, unbiased kind of way. As I read to the boys, I enjoyed giving the characters different voices (I only do this in the comfort of my own home with my own non-judgmental children!! ), and Charlotte's lines were my favorite to read aloud. Besides Charlotte, Aaron was also interested in Avery (Fern's brother) and Templeton (the selfish, disgusting rat). There's a picture at the end of the book where Templeton is huge and obese because he has been gorging himself so regularly. Aaron loves that picture and insisted we show it to Mike when he got home. One of the things that maybe escaped Aaron's notice but that I especially loved was the way death is explored in a very safe, but realistic, way. It's an interesting paradox that Charlotte spends the whole book trying to save Wilbur's life, but in the end, she herself grows old. So now, even though Wilbur's life is spared, his best friend dies, leaving him alone (at least for a time). It made me realize that wearing out our own lives in the service of others can bring a lot of joy and fulfillment. When we came to Charlotte's last words, my voice cracked; I couldn't help it. But Aaron was unmoved. He understood that she died, but I think he couldn't wrap his brain around the full ramifications of what that meant for Wilbur...or maybe he was just better at remembering that spiders can only live for a short time. I was reading this book to the boys one afternoon while they finished eating lunch, and out of the corner of my eye, I saw a spider dash out from under the refrigerator. In an instant, all thoughts of my love for Charlotte vanished and I grabbed the nearest object to smash her distant cousin with. But just as quickly, he turned and fled back to his dark home, and I haven't seen him since (even though I made Mike move out the fridge and look for him). Perhaps he, too, was just enjoying the story of Charlotte and merely came out to thank me. What he didn't realize is that while I might be able to fall in love with a spider in a book, I can never ever do it in real life. I read this recently and also really enjoyed it. Like you, I was struck by the book's depiction of death, and the sadness of Charlotte able to save her friend's life but not her own. I remember that when I was little, I didn't idolize Fern - I identified more with Wilbur, young and trying to find his place in the world! And now, like you, I have to think of Charlotte more as a mentor, because I too am terrified of spiders! It seems that we had very similar experiences reading this book. I saw on your blog that you're reading "The Trumpet of the Swan." I reread that one a few years ago and loved it. What a cute ending to your great review. Charlotte was almost my favorite. But I too don't do spiders in real life. Just found you through a BBAW Appreciation post, and I had to chime in on this, one of my favorite books, and my 7-year-old daughter's favorite. We've read it several times now. The first was probably when she was around 4, and she, too, was unmoved by Charlotte's death. The second time, she was 6 or maybe just turned 7, and she cried. But she still loves it, and each time I read it, I love it more. Amy - we read this book last year when Joyce was 3 and she became Fern to such a firm extent that we had to leave the park one day because she was so furious that someone she knew called her Joyce. Grace also became Fern's brother Avery and Joyce would even correct me on the pronoun "she" when I was referring to Grace saying, "He - mother, Avery's a boy" and yes she called me Mother because that is what Fern called hers. This lasted until just recently when she became Dorothy after reading and watching the Wizard of OZ. I love that she loves books but I wonder if she'll ever learn to write her own name (she's got Fern and now Dorothy down. . . ). Julie, your mom told me about Joyce's Fern obsession, and I was actually thinking about her when I was writing up this review. That is just too funny. Grace is a sport to go along with it.